An entertaining look at life as a golfer. 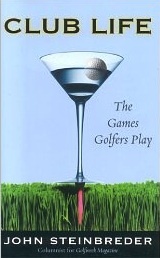 If you have spent any time around golf clubs and like a good chuckle this is the book for you. I was able to finish it over the duration of a couple of flights so its a quick and easy read. My favorite line from the book is one that the author overheard between two golfers talking finances . . . “This year has really been a tough one, but Mumsie died so things are looking up.” You just can’t make this stuff up!